Take an obstinate man determined to prove British racial superiority, put him together with a ‘brown’ state full of rebellious people, throw in a World War and you have a recipe for disaster. 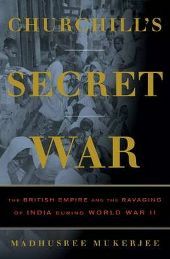 Churchill’s Secret War is journalist Madhusree Mukerjee’s expose of the real reasons behind the Bengal famine of 1943 – Winston Churchill’s determination to ensure that the British were well fed and looked after at the expense of the colonies. And his refusal to admit that India should be given its independence. When he died Churchill was given a hero’s funeral because he had kept British morale high in the face of Hitler’s Blitz. However, where India was concerned his policies had ensured that what had once been India’s richest state was drained and impoverished. Of course, Churchill had inherited his viewpoint from conquerors like Robert Clive who had come to Bengal determined to use the state’s riches for the greater glory of England. The first Bengal famine had, in fact, broken out shortly after Clive had taken up the reins of power, thought that fact paled into insignificance before the magnitude of the famine of 1943. What made matters worse was the fact that the British Government was aware of the situation but chose to do nothing. The primary reason for this was Churchill’s determination to ensure that Britain, which imported of its food supplies, did not suffer any deprivations during the World War. Churchill thought Indians to be “a beastly people with a beastly religion” and because India was soon going to achieve her despite his attempts to prevent ‘the liquidation of the British Empire’ he decided that India in general and Bengal in particular could be sacrificed to the cause of the Mother Country. To ensure that the widest quantity of food was available, Churchill ordered 27 million tons of imports for UK civilians during 1943. He also stock piled provisions to guard against inevitable post-war economic shocks. Churchill’s plans also included stock piling food supplies for the Greeks and Yugoslavs that the UK was certain to liberate, as a result cargoes of wheat from Australia passed famine-stricken Bengal by. Bengalis were “anyhow underfed”, he told his old school friend Leo Amery, the then furious Secretary of State for India and it was far more important to send food to “sturdy Greeks”. As a result, whatever supplies went near Bengal’s coast were sent to strategically vital Ceylon, “even if Bengal itself went short”. Whatever the reasons were, it is definite that over three million people in Bengal died in a deliberately created famine and that, according to Mukherjee, Churchill was responsible for it all. This had not been the premise with which Mukherjee started writing the book – she had originally been trying to understand the toll the famine had taken on the lives of people involved. However, the venality behind it dawned on her as she researched; speaking to those freedom fighters like Chitto Samonto from the village of Kalikakundu who were still alive and who in turn introduced her to other witnesses. Clive Branson, a British officer who was sympathetic to the cause of India wrote in his letters how from his train he saw: “One long trail of starving people. Men, women, children, babies, looked up into the passing carriage in their last hope for food…. As we pulled towards Calcutta, for miles, little children naked, with inflated bellies stuck on stick-like legs, held up empty tins towards us…the ordinary, decent people in England must do something—this is their Empire.” Branson, however, was very much in the minority and did not in any case survive the war. Churchill’s supporters claimed that the famine could not be relieved because shipping was scarce, but Mukherjee parries those “terminological inexactitudes” by pointing out that there was an excess of shipping in the summer and autumn of 1943, thanks to American cargo ships coming to the aid of the British. She also details the scorched earth policy that was carried out by the War Office. On the heels of a cyclone that devastated Bengal came the confiscation of fishing boats anticipating a Japanese invasion which never came. Seven years of research went into the book, resulting in interesting snippets like the Bengali women signaling advancing danger by blowing conchshells, knowing that the British would most likely mistake it for a prayer ceremony, or how women were trained in the arts of execution and could walk 35 miles in a night to be back sleeping in their beds by dawn. Mukherjee’s style is readable and ensures that the facts, horrific as they are, do not weigh the reader down. Mukerjee is now at work on a third book, devoted to understanding how imperialism works in the modern world. No Comments on "The Heart of Darkness"